• Ensure you are keeping out outside air and moisture. Insulate walls and attics, caulk and weather-strip doors and windows, and install storm windows. • Clear rain gutters so they don’t fill with water that could freeze and cause damage to the roof due to the added weight. • Trim tree branches that could potentially fall on your home during a storm. Hiring a professional is strongly advised, especially if any branches are near power lines. • Have your heating equipment and chimney cleaned and inspected every year. Ensure there are no openings in the chimney bricks or mortar or flashing. • Insulate water pipes with foam wrap or similar products to help prevent them from freezing. • Make sure all your fuel-burning equipment is vented to the outside, and the vent openings are clear of debris and snow. • Learn how to shut off your main water valve in case your pipes do freeze and burst. 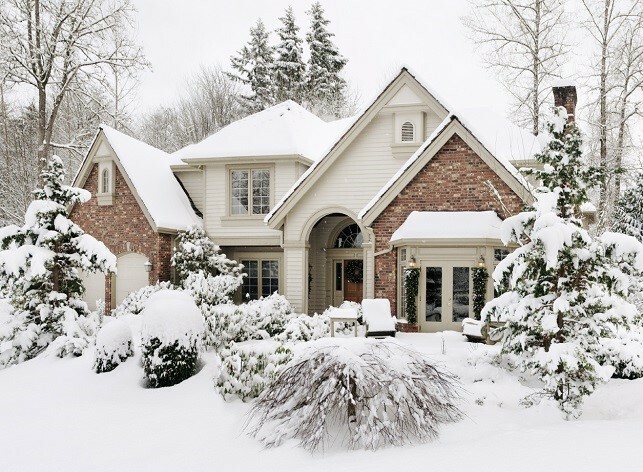 • Hire a contractor to check the structural integrity of your roof to sustain the weight of accumulated snow or water. • Keep fire extinguishers around the home, and make sure all family members know how to use them. • Never use a generator, grill, camp stove or other gasoline, propane, natural gas or charcoal burning device inside your home, garage, basement, crawl space or any partially enclosed area. And do not place the unit near a door, window or vent where carbon monoxide could seep indoors. • Space heaters should only be placed on a level surface and away from heavy foot traffic when in use, especially if pets or small children are nearby. It’s best to have space heaters that automatically turn off when a room reaches the desired temperature or in the event it is tipped over.